Kennards Hire Lift & Shift is the Platinum Sponsor of the upcoming 2015 Small Bridges Conference being held in Melbourne later this month. Taking place on the 23rd and 24th of November, the 2015 Small Bridges Conference will offer practical guidance to road and rail engineers, asset owners, managers, contractors and suppliers as well as bring them up to speed on new developments and requirements in the small and medium span bridge industry. As Platinum Sponsor of the conference, Kennards Hire Lift & Shift looks forward to participating in two days of industry education and networking. As a specialist equipment provider, Kennards Hire Lift & Shift services much of the bridge industry, offering lifting and jacking solutions in two forms. The company recently worked with Precision Jacking Services Pty Ltd to develop a total package solution for the customer. A Durapac Syncmaster synchronous jacking system was used to complete remedial maintenance works on dual carriageway bridges along one of Australia’s busiest metropolitan road corridors. A computer-controlled hydraulic jacking system, the Syncmaster provides a safe jacking mechanism for large scale engineering and maintenance projects. This unit allows for up to 16 power packs to be controlled by one master unit, giving a maximum of 128 individually controlled cylinder points. Kennards Hire Lift & Shift offered another major solution to the bridge industry in the form of spreader bars. 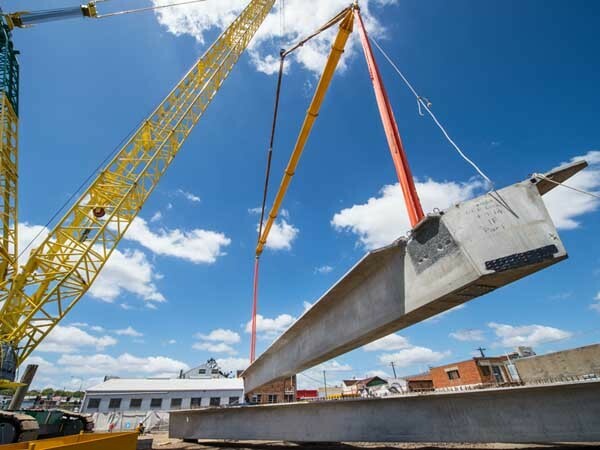 The 300T Modula spreader beam was put to use by Tutt Bryant Heavy Lift and Shift on a recent job that required the transportation and installation of 39 concrete girders for a roadway project. Part of a broader range of heavy lifting equipment available for hire, Kennards Hire Lift & Shift also offers load cells, nylon and chain slings, and shackles among many more.